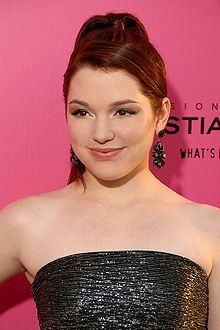 Jennifer Lindsay Stone (lahir 12 Februari 1993; umur 26 tahun) adalah aktor asal Amerika Serikat. Ia berperan sebagai Harper di dalam serial Disney Channel Wizards of Waverly Place. 2004 Line of Fire Lily O'Donnell Episode: "Mother and Child Reunion"
2005 Without a Trace Brittany Episode: "The Innocents"
House M.D. Jessica Simms Episode: "Heavy"
2009 Phineas and Ferb Amanda Episode: "Phineas and Ferb's Quantum Boogaloo"
2013 Body of Proof Hannah "Lost Souls"
^ Big Time Rush (2012-02-29). "Kids Choice Awards 2012 -Nominees - KCA 2012". Nick.com. Diakses tanggal 2012-03-31. Wikimedia Commons memiliki media mengenai Jennifer Stone.